Rich in traditional style, this sofa presents your living room with comfort and elegance. Its three seat cushions feature coil construction for luxurious, durable comfort. 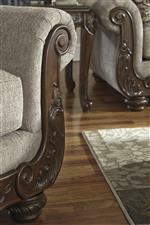 The sofa also offers large rolled arms accented by an ornate showood panels that continue along the front rail. A camel shaped back with accent trim, bun feet, and two square accent pillows and a kidney pillow, each with fringe, complete the sofa. The Cecilyn Traditional Sofa with Showood Trim & Camel Back by Signature Design by Ashley at Michael's Furniture Warehouse in the San Fernando & Los Angeles area. Product availability may vary. Contact us for the most current availability on this product. The Cecilyn collection is a great option if you are looking for Traditional furniture in the San Fernando & Los Angeles area. Browse other items in the Cecilyn collection from Michael's Furniture Warehouse in the San Fernando & Los Angeles area.